The total solar eclipse on August 21 will offer a visual feast, barring no unforeseen clouds or unwelcome rain. In fact, the event promises a spectacle the likes of which the continental United States hasn't witnessed in 99 years. Therefore, it's no surprise that campsites promising an unencumbered view of the celestial wonder have been booked for completely outlandish prices. 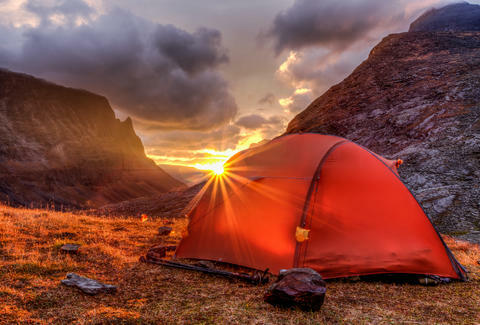 But even though the demand has resulted in some woefully steep prices for places to pitch a tent, there's still a glut of dirt cheap campsites available that've somehow flown under the radar. Luckily, the campground listing site Hipcamp has compiled a breadth of campsites that you can book for ridiculously low-ball prices. And all of the sites are situated along the eclipse's path of totality, which remarkably stems from Oregon all the way down to South Carolina. So yeah, there's a lot of valuable territory within the 60-mile-wide area primed to play host to the eclipse's most stunning darkness. The website has aggregated an overwhelming amount of campgrounds, many of which cost under $100 for a day camping out under the eclipse's shadowy gaze. From the northerly reaches of Oregon, down through the Great Smokey Mountains in Tennessee, and even a tree-top perch in Missouri, you'll surely be tempted to look into these sites, all of which are more or less ideal locales for witnessing the historic event. Booking for many of the sites is available through Hipcamp, so there's really no reason not to pool together a group of friends and throw down $10 for an unforgettable evening. Anyway, with airfare skyrocketing in areas destined to be heavily affected by the eclipse's all-encompassing darkness, sitting around before a raging campfire has probably never been a more welcoming prospect.